Re: Future World 1899 - Change Places! I don't have any problems with the current design, other than I need more. MORE, I say. Having said that, I like that you are your own biggest critic and that makes you continuously strive to make it better. And I will gladly accept whatever it takes to keep your interest in this project elevated, because I will never be ready for this one to end. I have an interview question for you though: What do you use for visual influences on this project, mostly all of the exteriors? This isn't something that can be easily googled. /\ A lot of it comes from existing Victorian Architecture, but mixed in with some industrial buildings and the odd steel structures and art-deco details. I'm fortunate that the UK has tons of excellent inspirational buildings for this kind of theme. 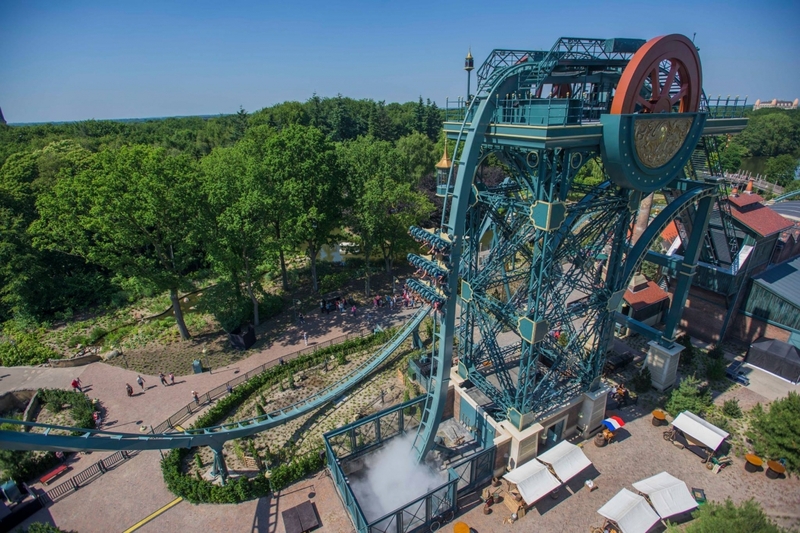 Baron 1898 at Efteling has been instrumental to the park's design, especially the colour scheme. So, the 'new' park is underway now. 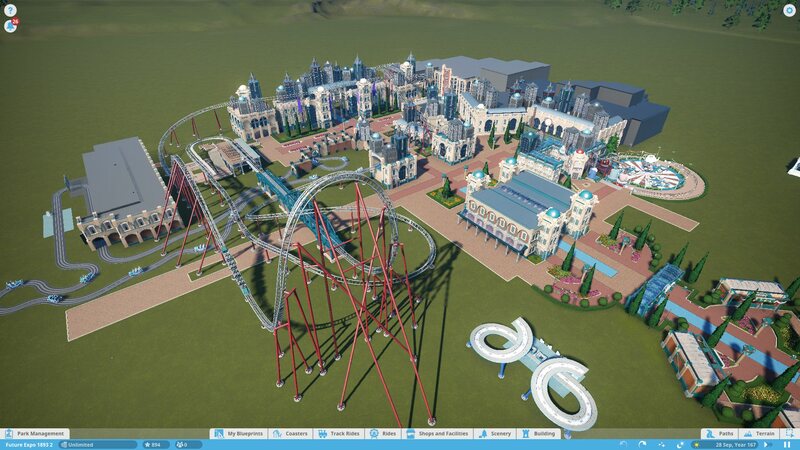 Things are changing as they go along, as most rides I want to add aren't made yet, but i've got something of a plan. The new entrance is built (as I'm rather fond of it). It's WAY smaller than the previous one, and far more realistic in scale. You'll see in the background a new ride...sort of. Skyrider was fun, but ultimately quite unrealistic. I decided that the tower portion of it wasn't that great, and I really would rather it interacted more with the park (whereas before it was self-contained). I have decided to combine it with another concept which has been done before: the bullet train coaster (videos released as 'Iron Horse'). 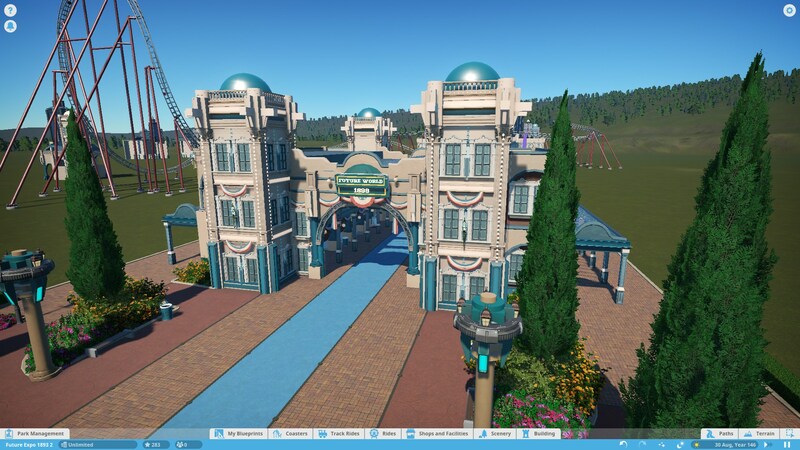 The plan now is to have the launched train themed coaster merged with the skyline theming of the Skyrider, and have the coaster after the 'top hat' element weaving around the buildings, which this time will have actual functions and are not just oversized scenery. Means the ride is simultaneously bigger and yet more compact as the space beneath it is in use. Your description of your future plans sounds like the threats of a Jules Verne villain, which I am TOTALLY down with and have no doubt that you'll deliver on. Are you hiring minions? You look likely to be the winner of any global war in the Victorian era . 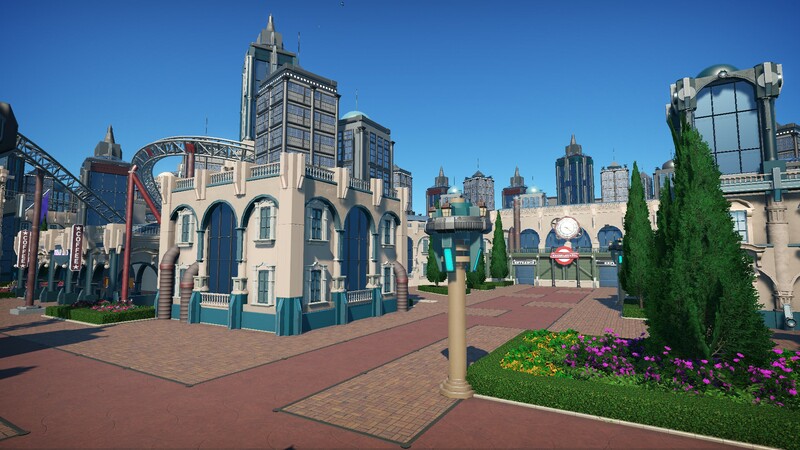 The first ride of this revamped Future World 1899 has now been released as a POV! Note: You can see the revised Iron Horse / Skyrider ride snaking around the side of the hotel as well in the first bit of the video. *well, the POV has, technically the queue hasn't been finished, but I wasn't fussed about that being in the POV. Ummm....YA! That was astounding!!!!!!!!!!!! Is there anything else in this park? What's your framerate? I know my computer would never be able to handle the insane detail. It's truly stunning!!!!! Holy crap, Heth, that is phenomenal! And you made the ride last the duration of "Sing Sing Sing" with segues into "In the Mood" on both ends. The music alone was worth the trip but the scenery was phenomenal and well paced with the music. A tour de force, and even a tour of the scullery . When can I book my stay? This is my kind of place! I can tell you now that the frame rate was about 10 FPS! The ride was built and filmed inside the park, but even when copied into its own file the main hall scene was CRAWWWWWWLING when filming. I had to film with Cheat Engine slowing the ride down 50% and then doubling the speed when editing the video. Bullethead: Thank you very much. I must confess Sing Sing Sing was slightly edited down from the longer version but still wanted to keep the pace of it, so I'm glad you liked it! Here's a little behind the scenes bonus. The ride is surprisingly compact, and pleasingly fits into a showbuilding in the park. 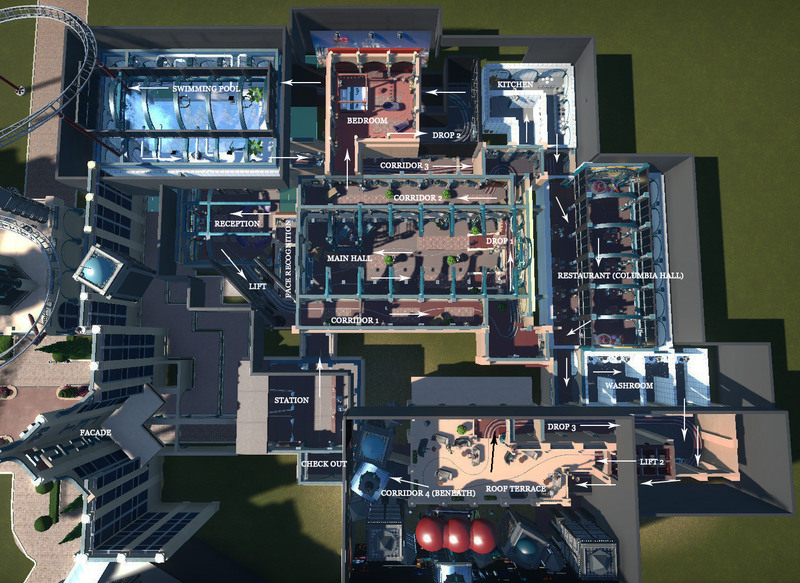 Getting all the rooms to flow together without wasting space was quite the challenge (the only 'dead' space is between the main hall / corridor 1 and the roof terrace). Below is a screenshot of the ride with all the roof and ceilings removed, and I've added labels to show the scenes. It also shows how small some of the scenes really are (for example the roof terrace scene is actually quite small). Wow, that was one of the best darkrides I've ever seen in Planco!!! This ride is amazing, imagineering at it's absolute best. The ride tells a story and you always want to know what comes next. The hotel atmosphere is perfect! And the coloring of the scenery matches perfect. Fantastic!!! Phenomenal as always, at this point I think I'd expect no less from you. Really liked the little pops of humor throughout and how you could've easily made this into a haunted attraction but went another direction entirely. So many clever scenery uses, great lighting, and as Bullethead said, that music is the perfect fit. I nearly gave you a standing ovation at the end! Such a darn cool ride. Congrats man. Thank you all for the comments of encouragement. This is my favourite ride I've done in the game so far and so it's nice to hear those sentiments echoed. Underground Express is the only coaster brought in wholesale from the last version(s) of the park. Hotel Futura has been built next to Underground Express. Rather than having Skyrider and Iron Horse from versions 3 and 2 of the park, the two rides are fused into one - as-of-yet-unnamed - ride which takes the launched section with a top-hat element and train theme from Iron Horse and mixes it with the city-theming and near-miss elements of Skyrider. The track has been built and this will then be themed. Beneath this rollercoaster will be eateries, shops and (if I can fit it in) a car ride weaving under the track. 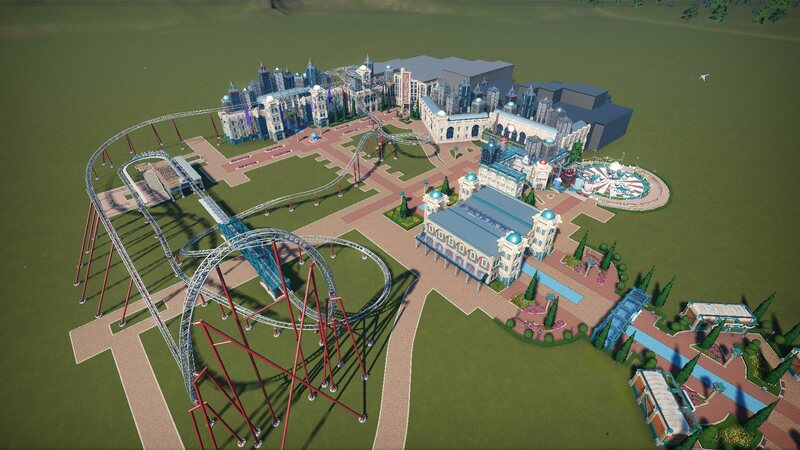 At the end of the 'main street' section in the middle is the facade for a Revolutions-style dark ride (something I made in my RCT3 years). I must admit I've been putting off doing this ride because I want it to be perfect. It is likely that if I ever get the courage to make it it'll be the last ride in the 'opening day' of the park so that it can at least be the culmination of the work on the park so far. Revolutions dark ride (RCT3)...a ride I fear I might struggle to improve upon in PC, but it's a challenge for me I guess! Eventually I will add aviation, industrial and 'outer limits' (e.g. space) themed lands, but for now want to focus on this Metropolis section. I also think some gardens might be a nice addition too, as these might fit with the Victorian theming. Looking good! Love the fake skyline. I really liked the original stuff and will miss War of the Worlds, but the new stuff looks even better. Still, I can't imagine scrapping all that great stuff. I suppose it's gone to Coaster Heaven . Future World is continuing well. Despite essentially rebuilding the park, it is coming together quicker than expected! Overview as of this evening. Hotel Futura fits in neatly with the coaster just in front of it. Hotel Futura at the end of the street, Underground Express showbuilding on the right. Underground Express on the right and the new coaster to the left. 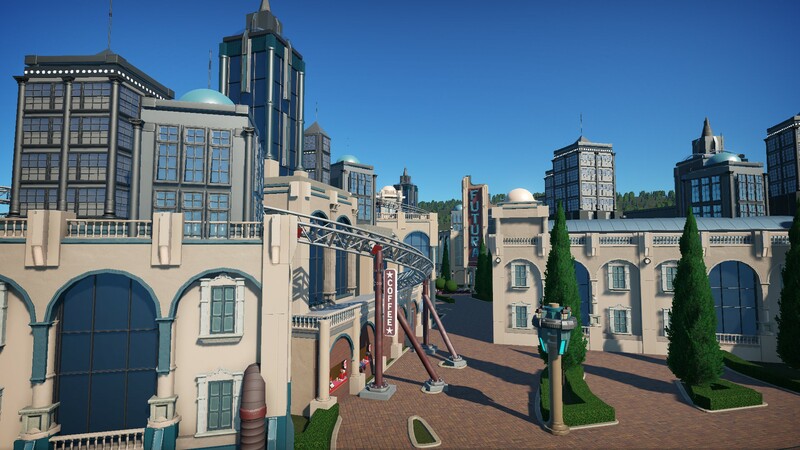 The new coaster is a replacement for Skyrider, and has the same kind of weaving through skyscrapers as that ride, albeit with a launch and a train theme. I've just seen the Hotel Futura video and I loved it. I was chuckling for most of it. The kitchen area was great with the flames jets and the bubbles. As well as being beautiful, there wasn't a dull second during the ride. The other new stuff is coming along very nicely too. This whole park feels like such a unique spin on retro-futurism. It gives me some Albert Robida-vibes, but it also reminds me of Fritz Lang's Metropolis and the Horizons ride from EPCOT. Loved Hotel Futura. 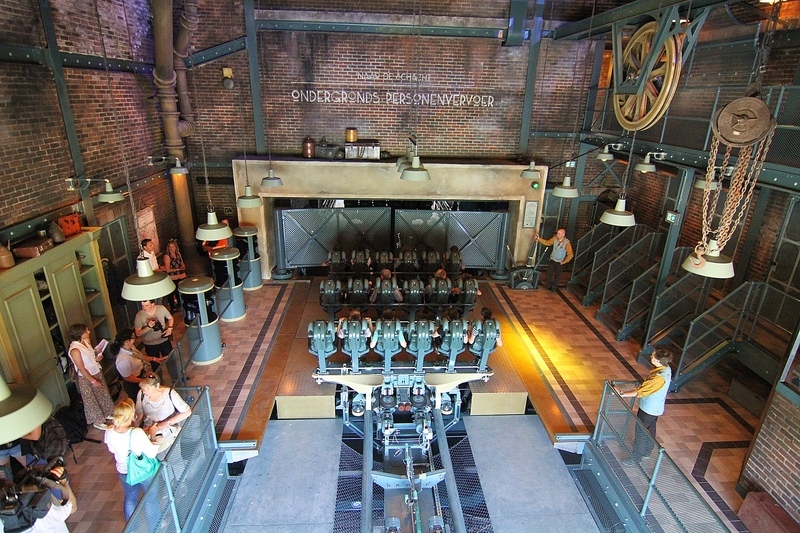 The design of the ride perfectly fitted both the tempo and atmosphere of the music. I've never seen a dark ride tackle the futuristic Luxury hotel-theme before. At first I wondered if a hotel-theme could really be all that exciting, but boy did you NAIL it. 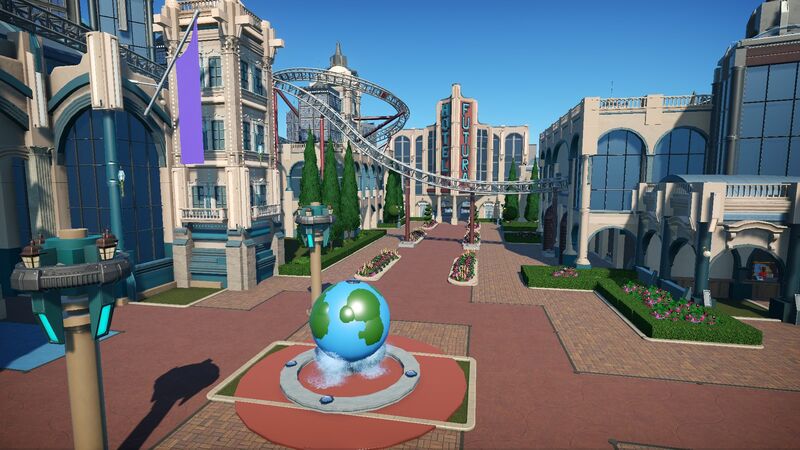 Also looking forward to seeing what you can do with the Planet Coaster variant of "Revolutions", as I just saw the RCT3 version of it for the first time and was very impressed with what you've achieved there. As someone who's regularly looking at Planet Coaster content the difference of graphical quality didn't prevent me from enjoying that video very much. It's just such a polished design with an enormous amount of detail. Lastly that overview shot (second picture) from you latest post looks great and makes me curious for a nighttime shot and how you will handle the lighting! The Hotel Futura dark ride is just a phenomenal experience. I was blewn away. You´ve out-done yourself agian, Heth. 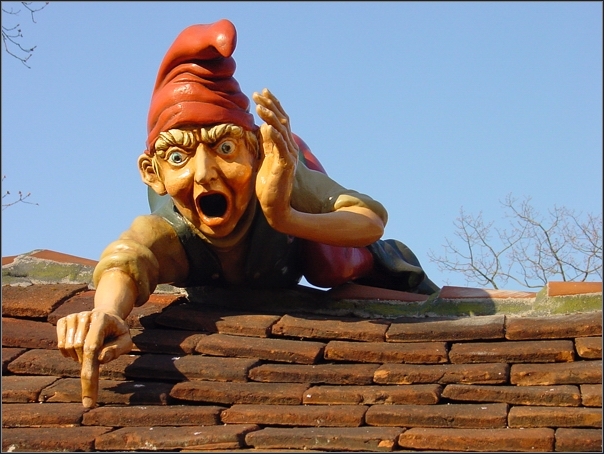 It´s unbelivable that you come up after so many mind-blowing dark rides with such a great ride. Everything is flawless. The music, the senenery (so beautifully detailed), the movements, lights and sound effects blending into a wonderful choreographie. Brilliant! I am so excited so dive into the swimming room in the sandbox experience.Btw my favorite part of the ride. Absolutly fantastic! 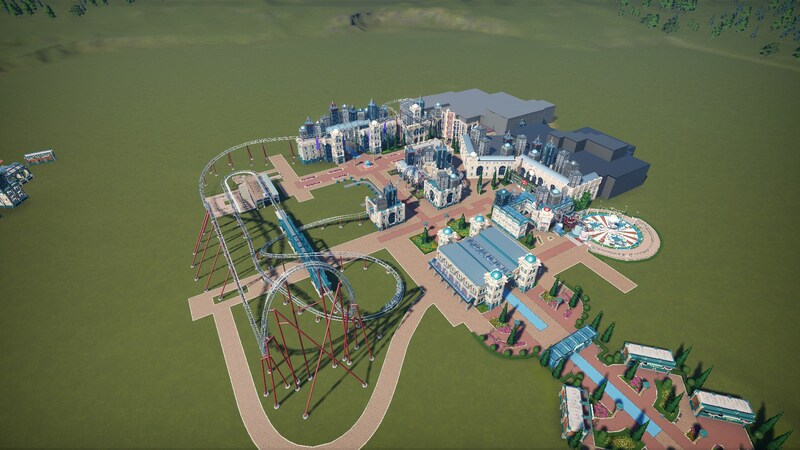 - I've been filling in the gaps in the Metropolis section of the park. This has involved adding in buildings and interweaving the World of Motors ride into it. The World of Motors ride starts in the 'factory' before going to the showroom and then into the city, but only the assembly line is built so far. - I was debating putting in Flying Ace from the previous versions of the park, but decided against it. I've done 'flying' themed inverted coasters so often and decided to buck the trend. 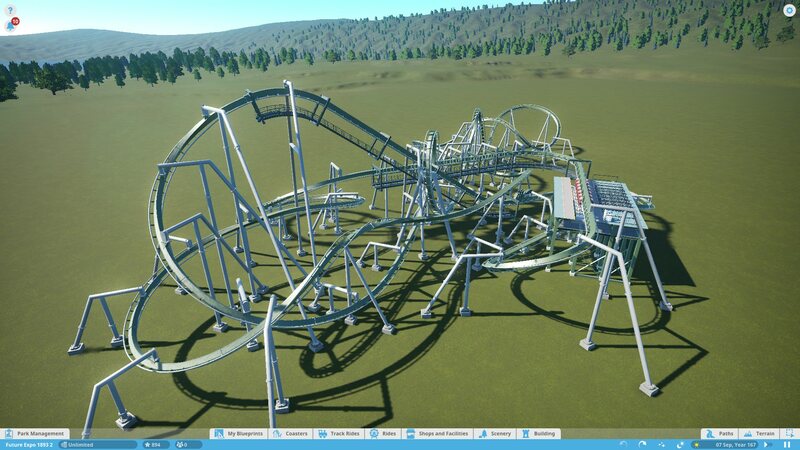 Instead I'm working on a 'metal forge' themed inverted coaster called Twisted Steel. The ride will be themed to the forging of a 'super-strong steel' (the ride track), starting in the hot furnace before testing the limits of the steel in the high-speed inversions. - I'm playing with the idea of adding in the newly included 'Peoplemover' style ride that came with the last DLC, but obviously I'd not planned for it, so it may not fit! The Flying Ace ride (and the War of the Worlds, and all the other wonderful stuff you scapped) was excellent and I hope you at least put the idea of zooming around forced-perspective skyscrapers into whatever you do next (plus Martian tripods ) But that Twisted Steel does look suitably knotted up for my tastes. I'm looking forward to how you theme it. BTW, that "forging super-strong steel" reminds me of one of the alchemical puzzles in the Opus Magnum game. If you haven't played that, I recommend it as it totally fits the steampunk thing of this park. If you have tried it, was that the inspiration for this ride? I haven't tried that game (or indeed even heard of it). Despite my use of RCT and PC I'm really not a gamer at all; I'm more just into theme parks. To be honest the inspiration is a bit more generally the Industrial Revolution and Jules Verne / H G Wells etc. I did an RCT3 ride called 'The Forge' which is essentially themed the same way as I intend Twisted Steel to be, just in coaster form. I was originally thinking of doing an RMC steel hybrid coaster with this theme, however I decided that I'd rather have an inverted coaster in the park at this stage. I rode Nemesis Inferno at Thorpe Park recently during the night and one of my favourite parts is the pre-lift drop into the volcano with red lights and mist, and I thought to myself that would work well in a 'furnace' themed section. That was fun . And very unusual in having a water coaster in such an environment. I might give it a bit more steam due to all the surrounding heat, though. The steel coaster was fun but it might like a bit of smoothing through some of the transitions. But all around, excellent scenery . I didn't even know we had animated bucket hoists. Where you get that, or did you somehow make it yourself via a deal with the devil? . I liked the glowing channels of molten metal in the casting area of the ride. Don't know why exactly, it just looked visually striking to me. I also liked how you told the complete story of the forge, from start to finish.